Elijah Sprague got to sit at the drive-through window and hand out cookies to about 40 friends that came by for the special day. 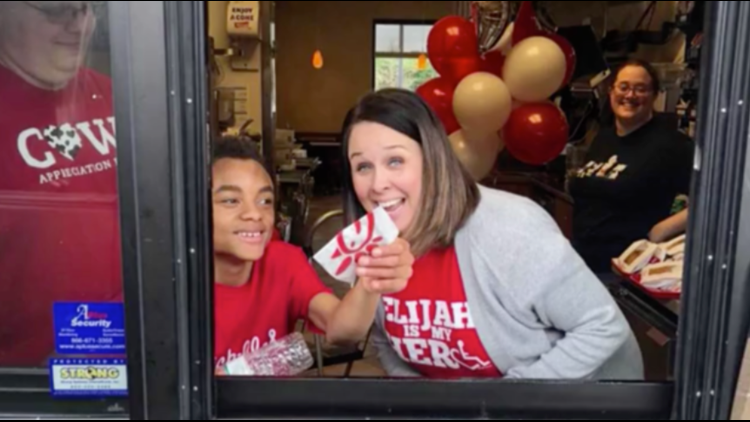 ALABAMA, USA — An Alabama Chick-fil-A opened on Sunday – something the popular fast food chain normally doesn't do – so a 14-year-old boy with special needs could celebrate his birthday. "My brother, [Elijah's] uncle, is one of the managers at the local Chick-fil-A," Rene Sprague told CBS News. Chick-fil-A is one of Elijah's favorite places and they visit his uncle there often. Her brother didn't know what the restaurant's owner would say about opening on a Sunday, but when he heard it was for Elijah, he said yes, without a doubt.